A large SPAR Supermarket opened in Jinan last month, the store not only expands SPAR China’s retail footprint but also presents many welcome features and departments. This SPAR Supermarket covering a sales area of 2,200m2 represents an investment of RMB 3,2 million and offers employment to 60 members of staff. 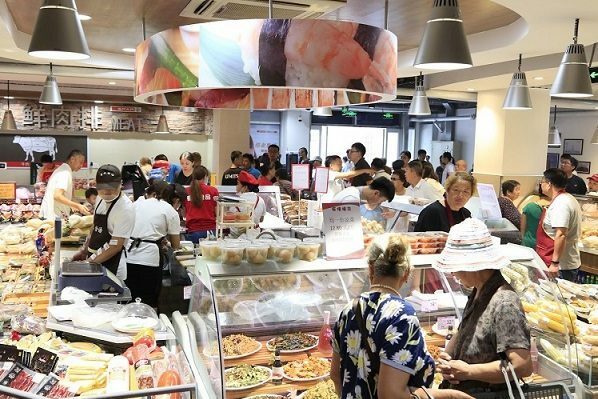 The store is not only expanding SPAR China’s retail footprint in the area but also introduces many features and departments which shoppers have reacted very positively to since the opening last month. The extensive range of over 7,000 products with almost 50% being imported from around the world is an added attraction for customers. A destination department is the seafood section with large selections of European crabs and Boston lobsters, and local fresh seafood; supported by a strong chilled supply chain which guarantees freshness. This supermarket benefits from SPAR Shandong’s fresh processing centre and central kitchen that delivers packed vegetables, processed fresh produce, and ready-to-cook meals instore widely sought after by time-poor shoppers. The strong focus on fresh in an attractively designed area has been adopted by SPAR China in other stores with success. Whilst the design and lighting system used throughout the supermarket create an enhanced shopping experience for the customer, attention has also been paid to the use of innovative technologies, including a self-checkout system, mobile payment devices and face recognition software. All fresh products have electronic labels and traceability codes, ensuring a seamless connection between inventory management and the product information traceability system through ERP, RFID and QR codes. SPAR Shandong will use the SPAR Daminghu supermarket as a benchmark to accelerate the brand expansion in the Jinan area, improving the provision of fresh, healthy and convenient services for local consumers.